Topics: Moleskine Classic Black Notebooks, Moleskine Gift Boxes, Moleskine Volant Notebooks, Star Wars Limited Edition Notebooks, and Moleskine Classic Red Notebooks. On average 1.30 pages are viewed each, by the estimated 112 daily visitors. 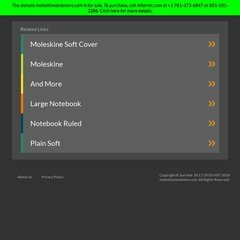 Moleskineandmore.com's server IP number is 68.142.205.137. Its 4 DNS Records include, yns1.yahoo.com, yns2.yahoo.com, and ns8.san.yahoo.com. It is hosted by Inktomi Corporation (California, Sunnyvale,) using YTS/1 web server.